Who Killed the Electric Car ? 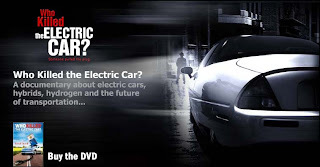 is a 2006 documentary film that explores the creation, limited commercialization and subsequent destruction of the battery electric vehicle in the United States, specifically the General Motors EV1 of the 1990s. The film explores some of the reasons that the auto and oil industries worked to kill off the electric car. Wally Rippel is shown explaining that the oil companies were afraid of losing out on trillions in potential profit from their transportation fuel monopoly over the coming decades, while the auto companies were afraid of losses over the next six months of EV production. Others explained the killing differently. GM spokesman Dave Barthmuss argued it was lack of consumer interest due to the maximum range of 80–100 miles per charge, and the relatively high price.